There’s a very nice interview with Joseph McElroy on Michael Silverblatt’s Bookworm: most interesting thing to come out of the publicity around Night Soul so far. Jace Clayton’s mixtape for Sharifa Rhodes-Pitts’s Harlem Is Nowhere is much better than a mix based on a book has any right to be. Outtakes from William Gass’s reading of The Tunnel at Inside Higher Ed. Stefania Heim interviews Susan Howe February 25 at the Graduate Center. 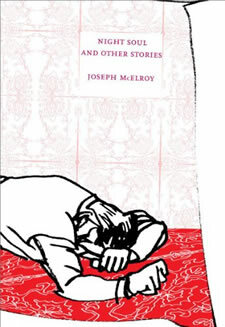 Having attended most of Joseph McElroy’s readings in New York since the release of Actress in the House, it feels a bit strange to be reading this volume of short stories, his first: I’ve heard a good number of them aloud before seeing them on the page, one twice. Some of them seem, in memory, to have been presented differently: what’s here called “Mister X” was read, I think, as part of Cannonball, a short novel; “Character” was an excerpt from Voir Dire, another novel. I don’t know what’s happened to those books; perhaps they’ll be published some time soon. The long-promised water book is evidently finished; an English version of Exponential could be assembled; and looking through the list at his site, it seems like another volume as large as this one could be assembled of uncompiled short stories. There’s a great deal of Joseph McElroy’s work that doesn’t exist in book form in English: this is frustrating, of course, but it’s also reassuring: there’s more of his work to come. Baudelaire isn’t mentioned here, but it can be surmised that he stands behind the accosting. Each of these stories works separately; but placed together, there’s a resonance, and one wonders if all of McElroy’s work might be put together into a giant roman fleuve, “”a memory you can’t have all by yourself,” a record of consciousness greater even than Women and Men. This voice in this paragraph suggests Don DeLillo, who took a few tricks from early McElroy; but what McElroy is doing here seems a ways away from DeLillo’s recent work. Science fiction here is useful shorthand: writing in that mode allows one to use the phrase “the once distinguished particle geologist with a crater in him” with impunity. This is explained in context, as are the Hows and Whats; but three reads in I still haven’t understood with McElroy’s doing here. Here and elsewhere in the book, McElroy shows that he’s still deeply interested in trying to understand the worldview of the scientist, perhaps in a lonely attempt to rebut C. P. Snow’s Two Cultures. (See also a piece from a few years ago, where he observes a neurosurgeon at work.) Scientists and engineers, usually men, wander through McElroy’s fiction, wondering about how to understand and approach big problems: again and again, he’s interested in how they think, and how they engage with ideas. The technician, for McElroy, might be an image of the writer. This short book has the subtitle “From Women and Men, a Novel in Progress”; it’s a section of that much larger book published on its own in 1987. This was a limited edition, beautifully printed by William B. Ewert, who ran a small press in New Hampshire that seems to have mostly published poetry. It’s a lovely book; used copies are still floating around. It’s nice reading McElroy like this: it’s easier to concentrate on the language, rather than trying to balance the myriad themes webbing through his larger books. McElroy’s prose needs to read (and re-read) slowly: it’s hard to do this with longer books. There’s a hint of why “Ship Rock” is used instead of “Shiprock” in the bisection of “monolith” in to its components, later elaborated: “And he thought he heard a car from far off toward the town of Ship Rock (spelled as one word with a small r, he later noted” (p. 34). The protagonist has heard the words ship rock spoken; he hears them as two words, not concatenated into a single word. Shiprock is a name; Ship Rock is a name and two words, both of which can signal. One of those words is factual: Ship Rock is a rock, albeit a very large one. The other is metaphor: people look at Ship Rock and see a ship. Much of this book is an attempt to make sense of the rock’s dual nature. 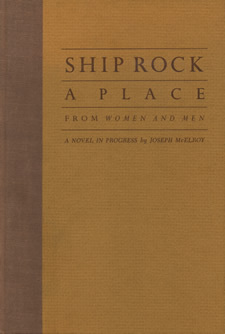 Plot is incidental to this book: the protagonist, who is unnamed and whose profession is left unclear, has traveled to Ship Rock and stops to consider it for a while. But wait, a voice says, we mean neck in the sense of throat. It doesn’t have to have a head on its shoulders. But the truth is that the throat is long gone: the neck is what’s left, the neck that was inside the throat, if you see. The voice that starts this is inside his head: he’s thinking about language, and trying to understand it: we understand geologic processes – a volcanic event – in terms of the more familiar. Association leads to more association; finally he ends somewhere else entirely. Little Neck, New York, where the clams are from, might get its name from a peninsula that looks something like a neck: a peninsula seems more obviously like a neck than a volcanic mountain does. But the language here catches: the last sentence sprinkles its iambs with anapests and begs to be read aloud. In the interjection, there’s an echo of the sixteenth-century “Western wind, when will thou blow” (“Christ, if my love were in my arms”). McElroy knows, of course, and his protagonist presumably does as well, that the Navajos, when they called Ship Rock “The Rock” wouldn’t have actually used those particular words: their own words would naturally have sounded different. Later in the book there’s mention made of an organization with the initials “D.N.A.”; those expand to “Dinebeiina Nahiilna Be Agaditah,” an actual Native American legal aid organization with an acronym that functions, intentionally or not, two ways. Coincidence is a driving force here; a place is one thing, a name is something else entirely. Proust mapped this territory first. This might perfectly be describing what’s happening in Ship Rock. A rock, something as massive as Ship Rock, is nothing if not concrete: but understood geologically, it had to once be liquid to exist. References to Sandia Man, Cochise Man, the Pueblo Indians, the Navajos, dot the text; all of these groups inhabited (or inhabit) the area around Ship Rock: the rock would have appeared the same to them, but humanity exists on a tiny timeframe geologically. This is a short book, a chapbook really, of material that was cut from Joseph McElroy’s biggest work, Women and Men. An earlier version of this was published in the journal Formations in 1984; I can’t tell why this is coming out now. A volume of McElroy’s stories is coming out in the fall from Dalkey Archive; I don’t know if that includes this, though I suspect it doesn’t. For the past few years, he’s been reading from a short novel called Cannonball which still doesn’t seem to have found a publisher, and he seems to still be working on his non-fiction book on water, which I’ve been awaiting impatiently. But any new McElroy material, no matter how unexpected, is a source of excitement to me: this is a small book, but one that lends itself to re-reading. The plot is easily related: a character named Enos comes to the narrator, Bethel, asking to borrow $1100 so that he can hire a detective to find his father, who left when he was two. The narrator is reticent to do this; other characters (who seem to be in their late twenties and early thirties in downtown New York in the early 1980s) are consulted, and a world is quickly fleshed out around this initial situation; it’s similar to when a pebble dropped into still water, and ripples move across an entire pond, hit the edges, and are reflected to create complex and unpredictable patterns. Here the patterns are created in the people in Enos and Bet’s worlds: their girlfriends, their relations, their friends. A world is slightly destabilized; it struggles to come back to stability. The interest in the book is in seeing how the characters react to a change – a slight one, but still a change – in their environment: it could be said that this is an ecological approach to fiction. Elizabeth had worked with Matt in the office of a lumberyard in Salem, and she loved him though she didn’t think he was the marrying kind, as she put it. But why were Susan and I piecing together this old story as if it were not so full of gaps as hardly to be a story? What did Elizabeth look like, I guess you always want to know. The letter had been typed and was the only news Enos’s mother had ever had. Confusing, for at the time Elizabeth wrote it, Matt had just the week before quit the lumberyard in Oregon and gone down to California, to San José, where he had a job working construction. There was more to it than that. Susan recalled that this woman Elizabeth had been already once a grace widow. The words are very simple; but the syntax is complicated, looping back and forth to cover a range of times. As the concern for “this old story” suggests, it’s a carefully literary voice: what’s being recounted here is something that’s past what a single oral narration could explain, a complexity that only literary writing can deal with properly. The section breaks create a rhythm only possible on the page, and the system of quotation – no quotes for recounted dialogue, quotation marks for dialogue that is happening in real time – suggests that thought has gone into creating something that works as a text. An auditor is occasionally possible; it’s hard to tell if this auditor is another character or the reader trying to understand the text. It’s a dry voice: there are echoes of the disinterested way in which Kafka relates “In the Penal Colony,” for example, though the use to which that voice is being put is very different: McElroy is deeply interested in the social world that seemed to terrify Kafka: rather than depicting a mechanistic world, the result of positivism, he depicts a world that’s deeply complex because of the myriad interactions. Preparations for Search seems to almost be a miniature version of The Letter Left to Me (the short novel that McElroy wrote after Women and Men: to my mind it works a bit better than that book because of its extreme compression, but Letter explores this book’s concerns about the meaning of paternity more deeply. 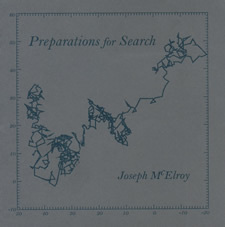 McElroy works by digression: digression for him is a tool to achieve verisimilitude in a complex world. I think his reputation has suffered slightly because of the shallowing of the pool of readers between the 1980s and the present: his work is unremittingly serious, an attempt to use fiction to think about the problems faced by the modern world, and I think that today’s readership, driven to distraction by endless amounts of entertainment, has a harder time sitting down with his large books. This is a shame: his work hasn’t lost anything over time but its audience; maybe his output of shorter works this year will regain some of that. It’s hard to tell very much about Small Anchor Press, the publisher, from their website; they seem to be new and based in Brooklyn, and it’s unclear to me how they came to be publishing McElroy. Preparations for Search is an attractive volume: the front cover looks good, though I don’t entirely understand the rationale for the square form, as it’s difficult to make a text block look good on a square page; consequently, the measure is a bit too wide for my taste. The presentation is a bit oblique as well: the text is composed of different sections, some only a paragraph long, and section breaks have become page breaks, giving the book an almost aphoristic look. This becomes confusing with longer sections that span pages (a problem also found when setting poetry); it can be hard to know whether a paragraph break at the end of the page is a section break as well, which matters when the sections present discontinuous moments in the book’s narration. But these are quibbles: it’s nice to see any new McElroy work, and any press that’s publishing him is worth keeping an eye on. “. . . . What little I know about acequias in that general area – including the Rocky Mountain high-altitude meadow system now threatened by climate change – I know from Stanley Crawford. Tangible work on the land and on the page. That difficult double career never seeming (at least to me) at Stan’s apparent pace egregiously difficult or impeded, so much as continuing and contained and unscreened by word or delusion. This “over-educated novel-writing truck farmer…caught between two eras like a [Turgenev] character” who has put into his non-fiction book the “veins and capillaries” of this land, the work of maintaining the ditch among other things in every inch of effort and knowledge shared with the fortunate reader, the sometimes bewildering interruptions of uncontrollable weather, the “human constrictions and diversions the mayordomo” must take charge of who is “the pump, the heart that moves the vital fluid down the artery to the little plots of land of each of the cells, the parciantes.” (In Outwater and elsewhere we hear the metaphor of blood circulating, which anciently is a correspondence not metaphorical at all. Crawford is somewhere in between, though not in the following remark.) “Water relationships would be simple and linear were they not complicated by all those other ways that human beings are connected with and divided from each other: blood, race, religion, education, politics, money.” Rights likely to be most nearly reliable locally as here, a precinct of water democracy I imagine. Walking the ditch, Stan and I come upon a crossing where the beavers have messed things up, two chewed saplings are down across the steep-banks, maybe not even a dam-in-progress. The everyday passingness must be more than passing, though he might shrug off this thought (or that water “rights” [my “quaint,” he calls it, archaic contribution] have anything to do with where you live, considering major diversions of water just about everywhere in the world though the New Mexico basically usufruct – “ownership” custom is archaic. Maybe a luxury of my experience of his life and that I will come back (as he himself will go to market every week in season) and that I will reread him and believe that some metaphors are more than comparisons. Is Stan’s writing what will last? In these remarks of mine, I come back to several figures. Second thoughts? Odd, this revisiting. “Accretions” the title of Chapter 17 of A Garlic Testament and typical of Stan’s method: “what people do to make things grow . . . consists of . . . eliminating everything else that gets in the way.” My own writing is weeding since I’m always experimentally planting (maybe weeds like nutritious amaranth) just to see, and maybe this analogy stretches things. Revisiting is clearer, though: rereading a person, seeing what I didn’t see before. Facts, however: Stan doesn’t know how much longer the current generation of ditch commissioners and mayordomos can handle drought years, before saying the hell with it – like so many small farmers. Garth Risk Hallberg on Joseph McElroy’s Women and Men at the LA Times book blog (note also the interview with John O’Brien of the Dalkey Archive there). Jacob Silverman on the new ludditism in literature at the VQR blog. Plays based on Felipe Alfau’s Locos, very soon in New York. Robert Kelly’s “Letter to Thomas Bernhard” at Cerise Press. An online variorum edition of Baroness Elsa von Freytag-Loringhoven’s poetry from the University of Maryland.